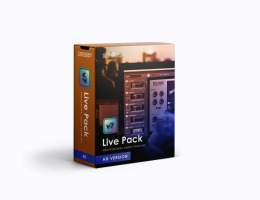 McDSP is proud to introduce Live Pack v6 II, a collection of highly acclaimed plug-ins for mixing live performances. Features like ultra low latency, superior sonic flexibility and seamless integration with the Avid VENUE live sound system make Live Pack a must-have for any FOH or monitoring engineer. The McDSP Live Pack II bundle has even more to offer for Avid S6L users. New plug-ins include the 6034 Ultimate Multi-band, 6050 Ultimate Channel Strip, AE600 Active EQ, EC-300 Echo Collection, ML8000 Multi-band Limiter, and the NR800 Noise Reduction Processor, in addition to existing plug-ins from the original Live Pack bundle – Channel G, DE555, FutzBox, ML4000, NF575 and the Emmy Award winning SA-2 Dialog Processor. All McDSP Live Pack II plug-ins operate with ultra low latency while offering the best fidelity possible with 64-bit internal processing and real-time control smoothing for analog-style response to parameter changes. In addition to supporting the Avid VENUE systems (S3L, S3L-X) Live Pack v6 plug-ins also run as AAX DSP/Native formats on Pro Tools HD, LE, and M-Powered systems, as well as on any Audio Units or VST compatible DAW.